Many Apple users look to Kinesis to provide professional-grade ergonomic keyboards that look great, but also work well with a wide array of Apple devices. We have keyboards designed specifically for Mac operating systems and keyboards that can be conveniently toggled to Mac mode. 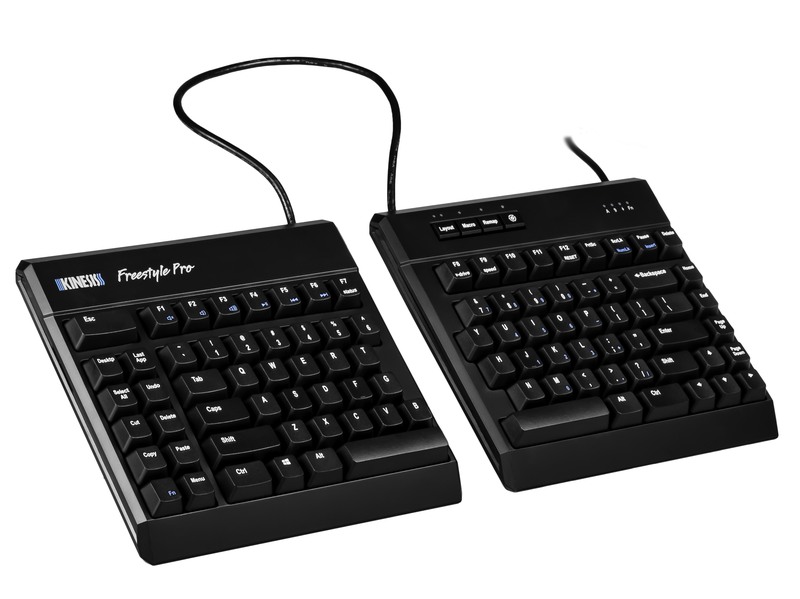 Our best-selling ergonomic keyboard for Mac users is the wireless Freestyle2 Blue for Mac. The Freestyle2 Blue for Mac takes our popular Freestyle split design and updates it specifically for Apple users. With our Multichannel Bluetooth technology, you can pair the Freestyle2 Blue for Mac with any Mac desktop system, Mac notebook, iPad, and iPhone, even your Apple Watch. 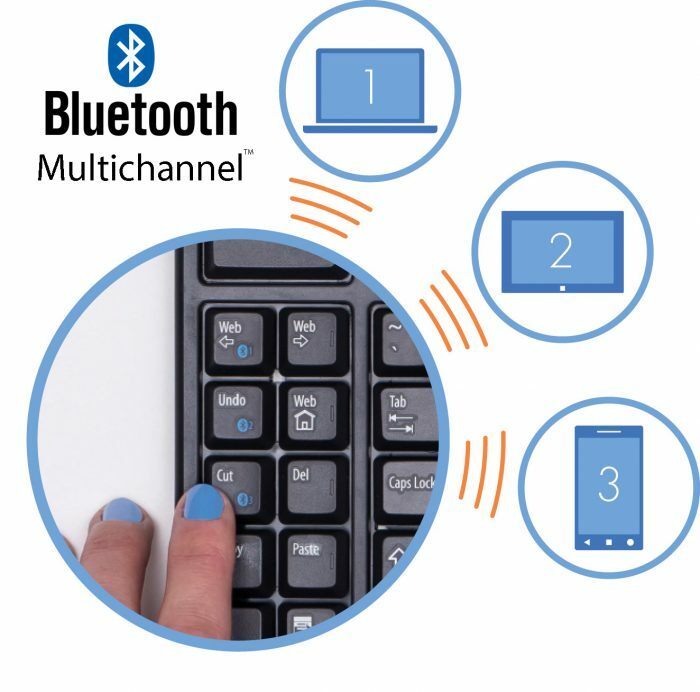 Pair the keyboard with up to 3 Bluetooth-enabled devices (range of ~30 feet) and instantly switch between them with the touch of a button. The Freestyle2 Blue battery is designed to last 4-6 months on a single charge so it’s great at home, in the office, and on the road. Enjoy all the ergonomic benefits from the Freestyle2 line with your Mac including splaying with the optional pivot tether, a choice of up to either 9” or 20” separation, and available tenting of 5, 10 or 15 degrees using the V3 or VIP3 lifter accessories. 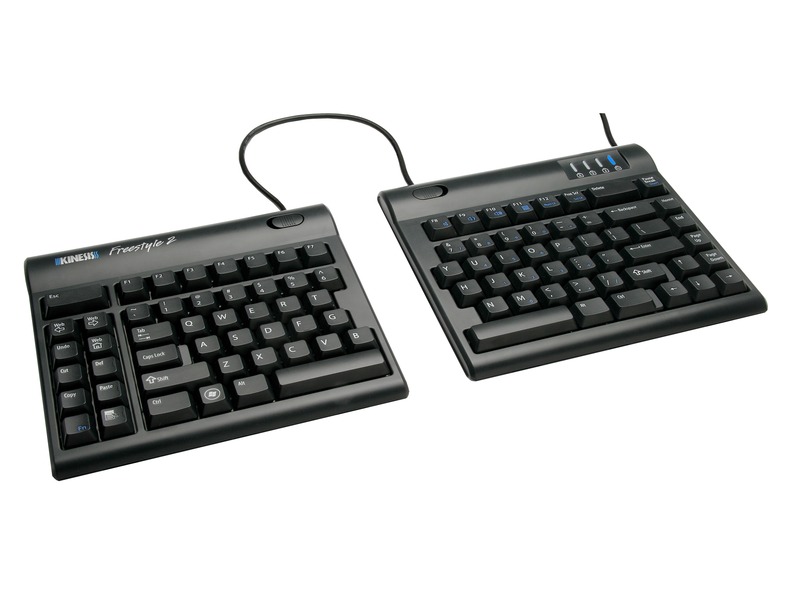 Add Palm Supports and cushioned Palm Pads for the ultimate in typing comfort. Note: Software engineers and others who require regular access to the standard F keys may prefer the USB model because on the Bluetooth model the Fn key must be held down to access F1-F12. 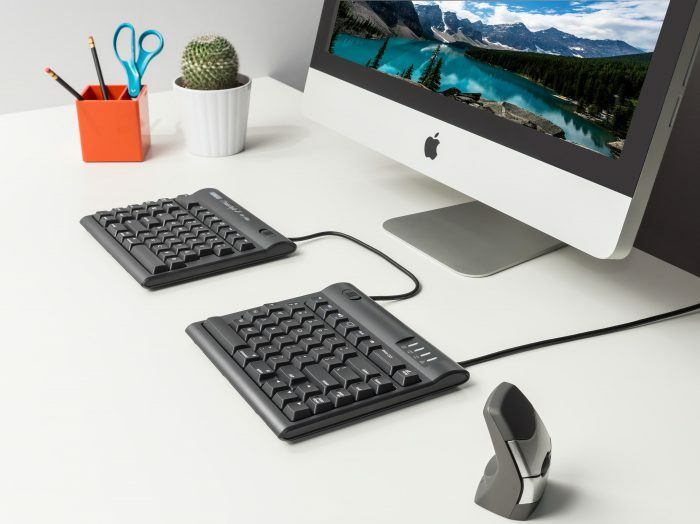 The Freestyle2 for Mac USB keyboard features the same great ergonomic design and layout as the Bluetooth version but uses a 6 foot USB cable for connecting to most Mac desktops and laptops. 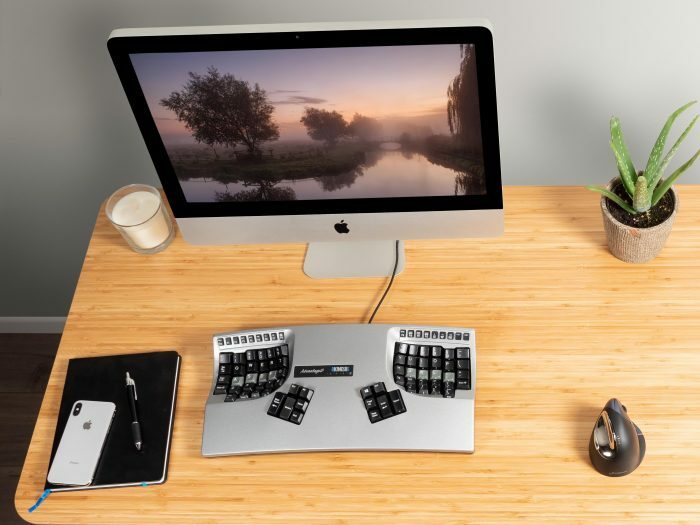 The USB version also includes an additional 2-port USB hub on the keyboard which is especially convenient for connecting a mouse or headphones if your Mac only has a single USB port. Note: 2016 and newer MacBook Pro notebooks have a single USB-C port which requires an adapter to use with any conventional USB keyboard. Kinesis recommends the Freestyle2 Blue for Mac for individuals looking to use an external keyboard with a newer MacBook. 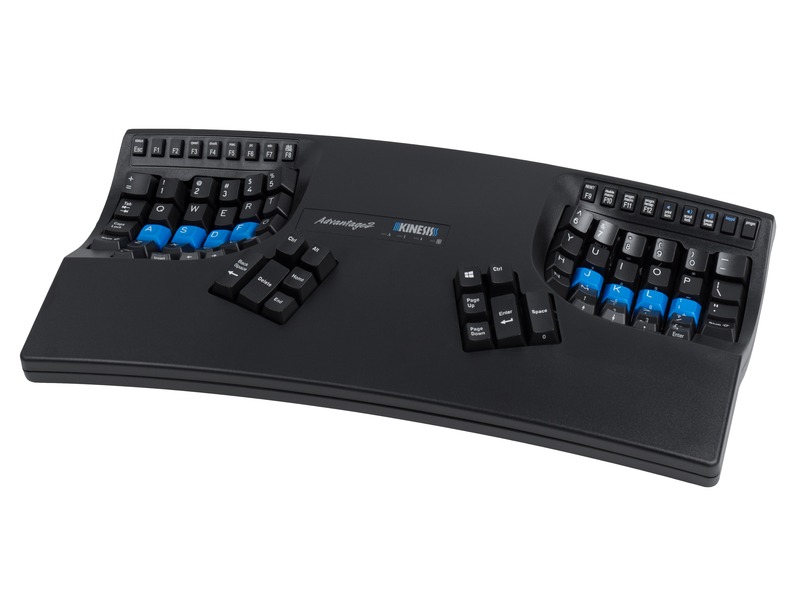 The Advantage2 is Kinesis’ flagship ergonomic keyboard. It features an incredible array of ergonomic features designed to address the major risk factors for repetitive strain injuries associated with typing. 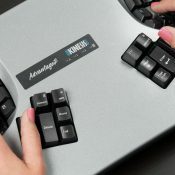 It also features the all-new SmartSet Programming Engine designed to let you build custom keyboard layouts by remapping keys and recording powerful macros. 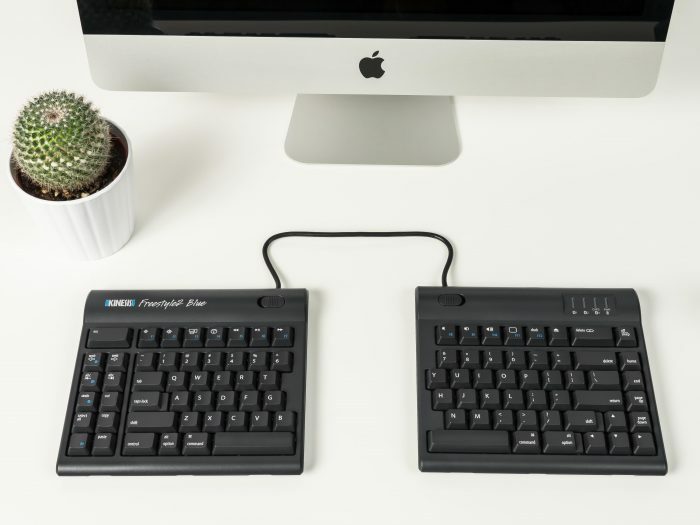 Unlike the Freestyle2 family of keyboards, all Advantage2 keyboard models are universally compatible with both Mac and PC operating systems. For Mac users, the Advantage2 can be switched into the Mac Thumb Key Mode which enables the Command, Control and Alt Option key functions synonymous with Mac keyboards. We even include 4 extra Mac keycaps for your convenience. Choose from one of the five models of Advantage2, or build your own with the new Signature Series program. The only differences are the key cap legends (QWERTY or QWERTY-DVORAK dual legend), the key switches (Cherry MX Quiet Red or Cherry MX Brown), and top case styling. Aluminum MacBook and iMac users will want to check out the Advantage2 Silver which is designed to match the design cues of those stylish computers. All Advantage2 keyboards are USB so they require a Mac with an available USB port. Savant Elite2 USB foot switches are designed to work on both Mac and PC operating systems because they use a simple .txt configuration file to store the pedal’s programming commands. For Mac foot switch users, we have developed a Mac-specific SmartSet Programming App making programming custom actions for the foot pedal quick and easy from any Mac computer. Simply toggle the pedal to Program Mode using the switch on the underside of the foot pedal, and then launch the Mac version of the SmartSet App. No installation or special drivers are required and all custom actions are saved directly to the pedal. Our popular “precision grip” DXT2 vertical mouse is compatible with Mac Operating Systems 10.4 and newer. Intuitive hand positioning (i.e. similar to holding a pen) allows the DXT2 to fit nearly any hand size (very small to very large) while providing a high degree of accuracy from a relaxed posture all with a feather-light touch. Choose from a wired USB model or a wireless model that uses an RF dongle for connection to one of your Mac’s available full-size USB ports. 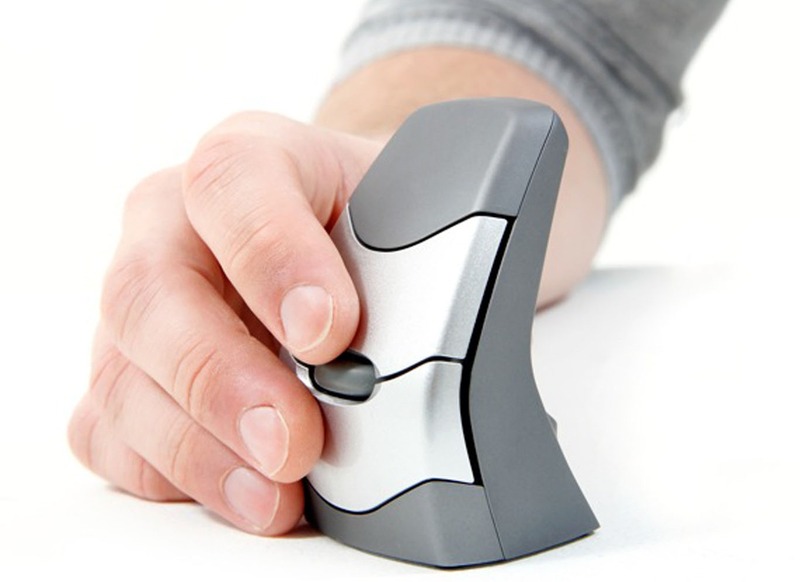 The Evoluent VerticalMouse 4 has a patented shape that supports your hand in a relaxed handshake position, yet requires no adaptation period. The Evoluent comes in two sizes, Regular and Small. The Evoluent is compatible with Mac Operating Systems but requires the installation of a downloadable driver to enable programming of the 6 programmable buttons on a Mac. Choose from a wired USB model or a wireless model that uses an RF dongle to connect to one of your Mac’s available USB ports.